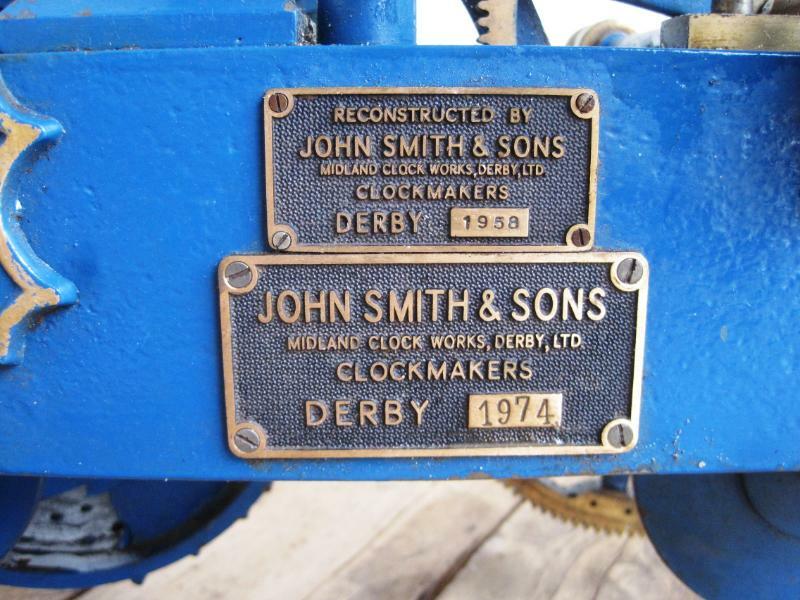 As previously mentioned the visit to Smith of Derby revealed that our clock would have had a double three-legged gravity escapement, not the pin wheel we were expecting. The clue was apparently the extra rail inside the back edge of the frame (cast iron, bolted on) to which the arbours attach, seen here at the bottom left of the picture. 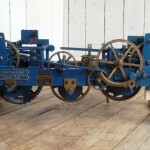 On an equivalent Smith pin wheel clock this extra rail is not there and the arbours extend right to the back rail of the main frame. 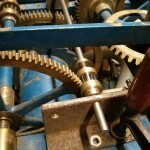 The double three-legged gravity escapement is better at time keeping, especially on a turret clock. The impulse to the pendulum is not affected by any forces in the going train, so large hands covered in snow do not affect its accuracy. 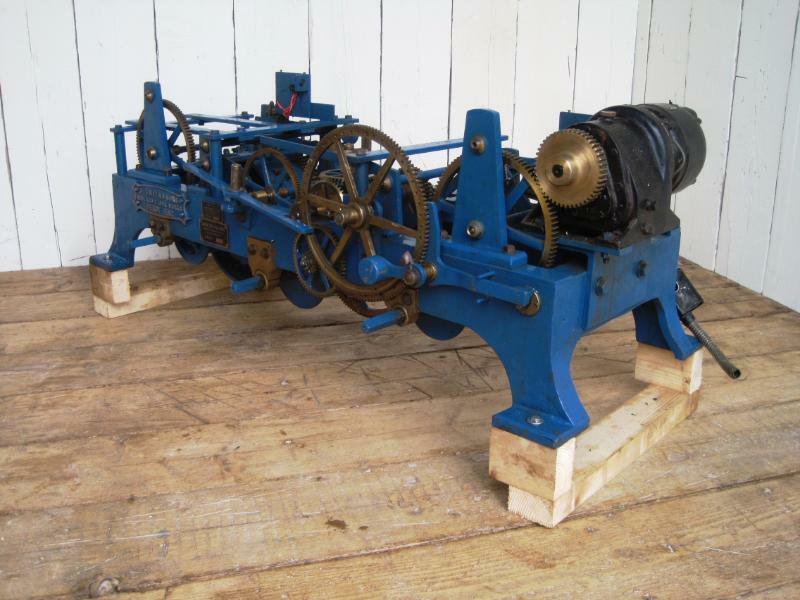 It was invented by Edmund Beckett for use in the clock commonly known as Big Ben. 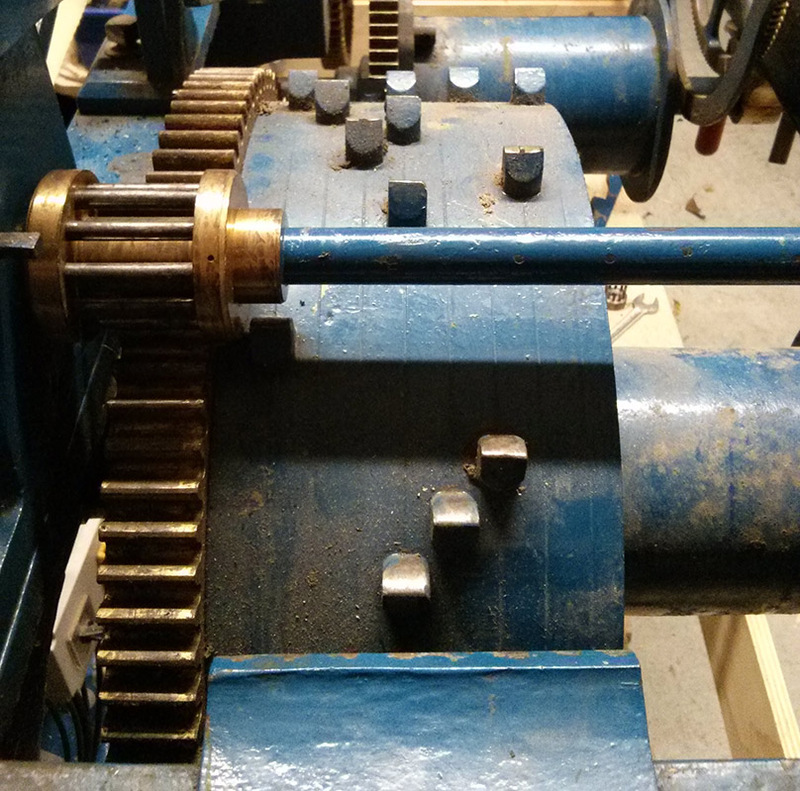 While we hadn’t quite worked out how to make the pin wheel escapement, we think this one is going to be harder. As with a much of this project it’s the unknowns that make it difficult. 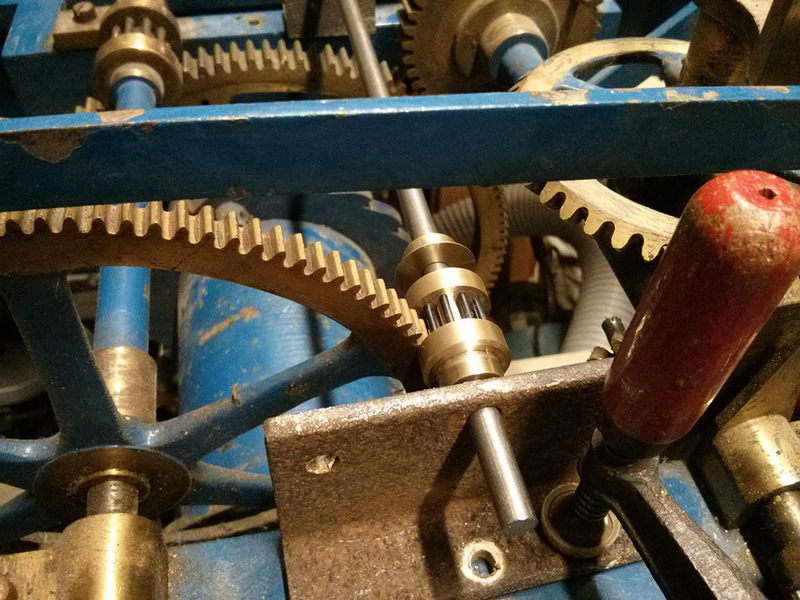 We had studied all the pictures we could find of Smith pin wheel escapements and worked out a fairly plausible pin count and pendulum length. Now we have to do this again, but this time there are more variables. The arbour we need to replace in the going train should rotate once per minute. You can put a small dial and a second hand on the end of it if you like. Since hearing this I have found an image of one that has a second hand. 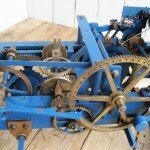 It was suggested that the clock probably had a 1.5 second pendulum and a 90:9 ratio coming off the escapement. All these old clocks were a bit custom made, they didn’t stick to plans (probably for good reasons at the time). This means there are no suitable plans that they could give us for a clock of this date. 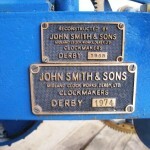 It also means that any info taken from another clock may not apply to this one. Trying to put the first two facts together does not seem to fit and that’s where the third probably comes in. By my maths (which is not infallible) a 1.5 second swing advances the scape wheel a 6th of a rotation, which means 9 seconds per complete rotation. 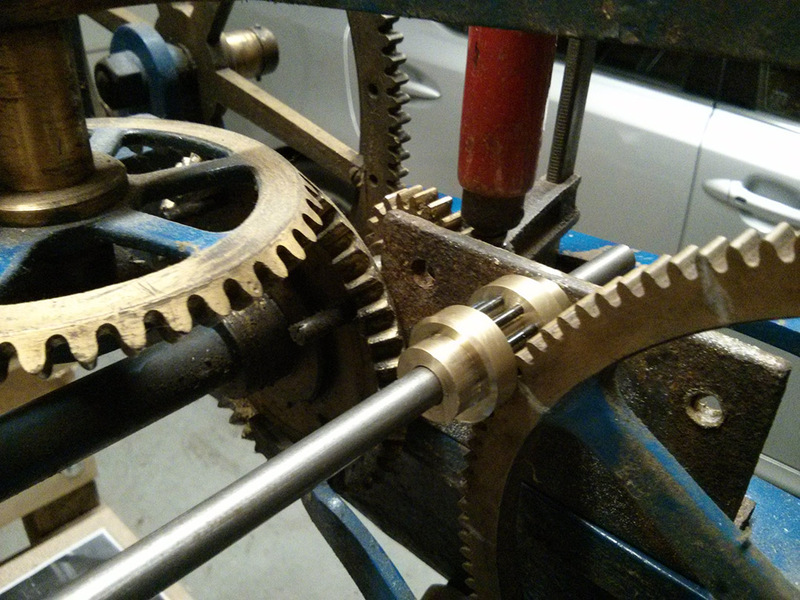 Turning a 9 pin lantern pinion against a 90 tooth wheel (a 1:10 ratio) means a 90 second revolution for the arbour, not the 60 you’d need to put a second hand on it. 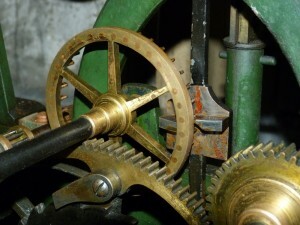 We need to move the next (existing) wheel in the train one tooth every 7.5 seconds, which would be possible if we had a 12 pin lantern pinion (instead of the 10 pin we have already made). So this is workable, but doesn’t give us a 60 second rotation of the arbour. 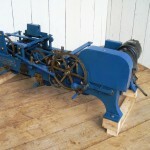 1.5 second swing, 90:9 ratio, 12 pin lantern – gives a 90 second rotation of arbour (as worked though above). 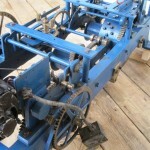 1.25 second swing, 90:9 ratio, 10 pin lantern – gives a 75 second rotation of arbour. 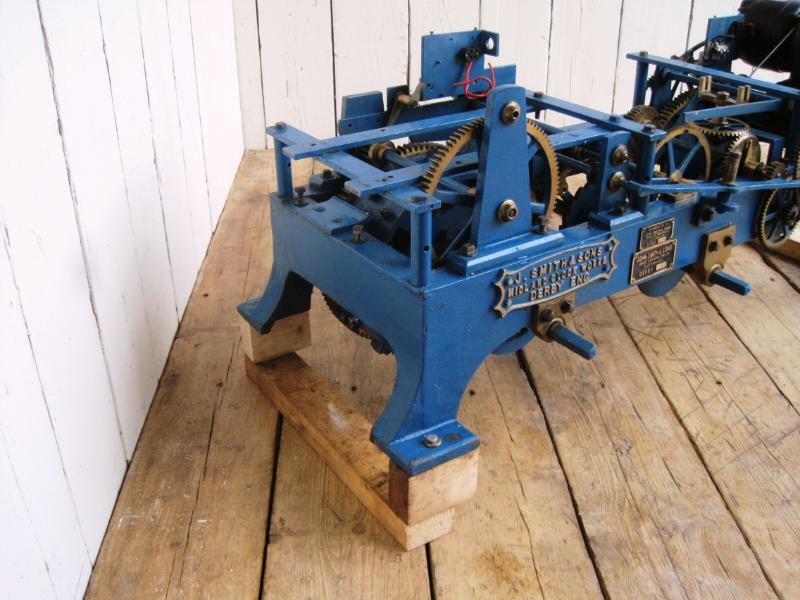 1.25 second swing, 72:9 ratio, 8 pin lantern – gives a 60 second rotation of arbour. 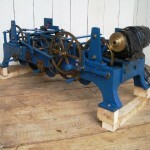 1.125 second swing, 90:9 ratio, 9 pin lantern – gives a 67.5 second rotation of arbour. 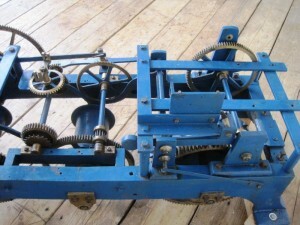 The engineer my Father spoke to at Smith’s sent him a picture of an escapement that probably comes from a similar clock. From what my Father told me it sounds as though they have a database of clocks they maintain, with pictures, and he looked up what he thought should be a pretty similar model. 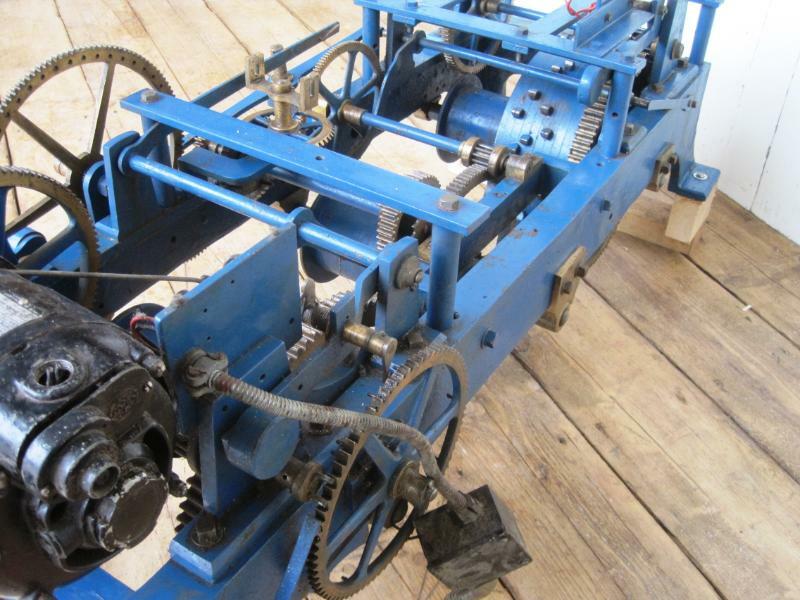 It’s difficult to count the teeth exactly in the picture, because you can only see a couple of sections of it, but it appears to have a 72 tooth wheel. 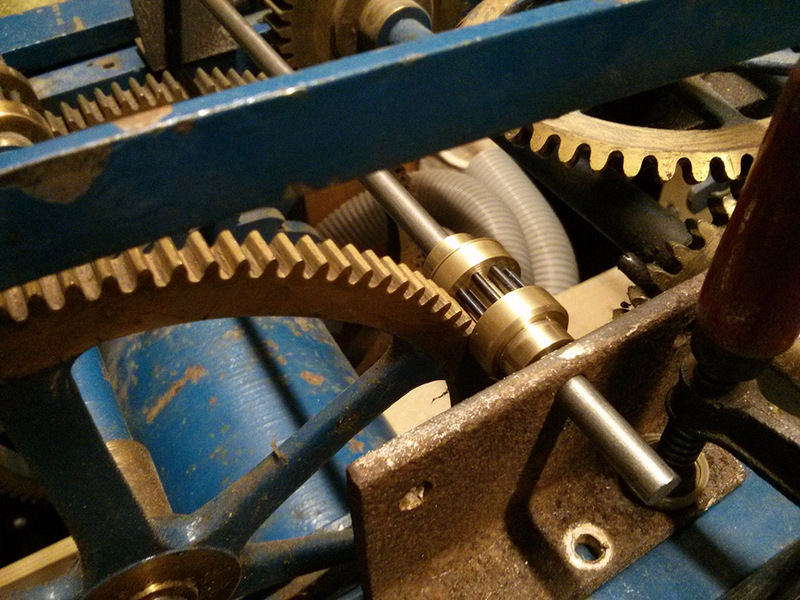 Unfortunately you can’t see enough pins on the escapement lantern pinion to count them. 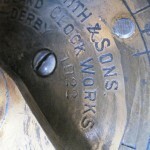 My father emailed Smith of Derby to see if they could help us identify where this clock had been installed and if they had any information about it that could help us recreate the missing parts. As we are local to Derby he was invited over to look at a similar three train clock they had in their workshop. 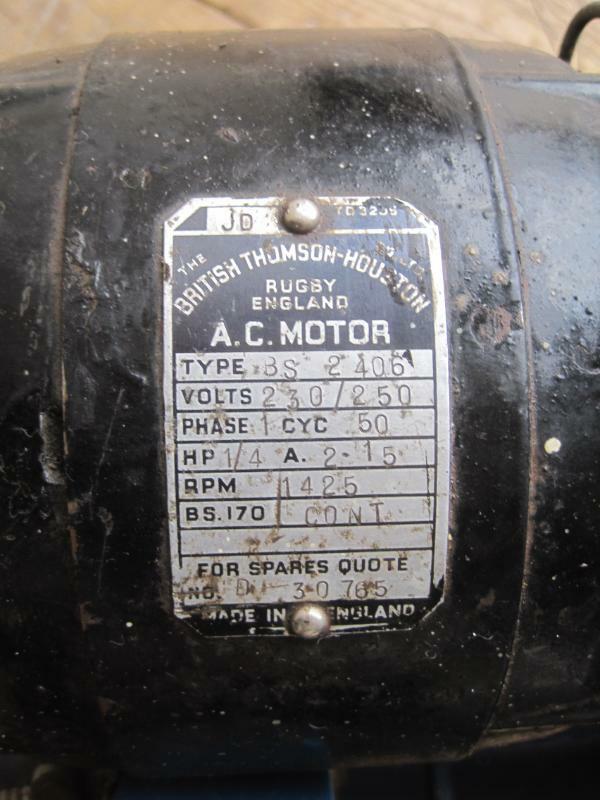 They very kindly allowed him to take measurements and photos and one of their engineers answered his questions and supplied some printed information. Unfortunately they weren’t able to tell us where the clock had been. It doesn’t have any kind of serial number so tracking it down based on “I was told it came from Bournemouth” was rather a long shot. 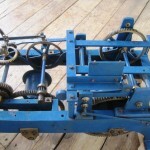 We did learn lots of useful things though, probably the most important being that the clock did not have a pin wheel escapement as we thought – it would have had a double three-legged gravity escapement. Another thing we discovered is that they likely did the electric conversion. That was a bit of a surprise. I guess it was done in the 70s (there is a Smith plaque, dated 1974, over the hole where the maintaining power should have been) and lots of dodgy things were considered the norm back then. If you have a clock you’d like motorised be assured that’s not how they do it anymore! I’ll mention other bits of info picked up on the visit in appropriate posts as they crop up. 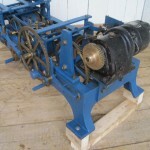 This clock has quite a large chime barrel compared to many of the turret clocks I’ve found online – it has 8 positions across the barrel meaning it uses 8 bells. But what’s the tune? There are 4 pins on the side of the barrel (actually only 3 are intact, a little of the forth has a remains snapped off in the threaded hole which might be a pain to get out). 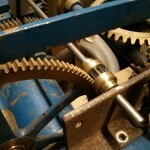 These stop the chime when the end of the tune is reached. 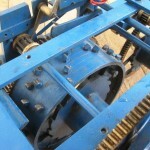 This suggests that the barrel rotates once per hour and plays at all 4 quarters. This might sound obvious but apparently the East Garston church clock has two copies of the tune on the barrel and only rotates once every two hours (presumably there 8 pins around the edge). The pin stops the chime when it reaches the top and the projections that move the hammer levers (I’m sure these must have a proper name) do so at the edge of the frame. 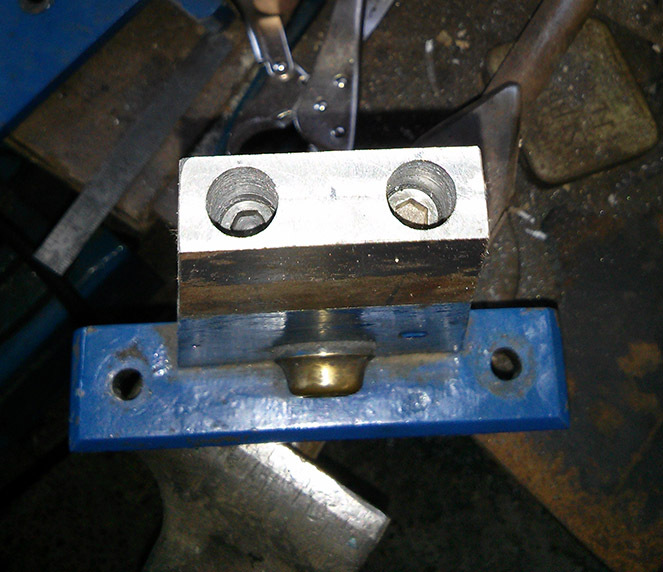 So with barrel positioned with a pin uppermost there should be a gap in the projections where the hammer levers can rest between quarter hours. 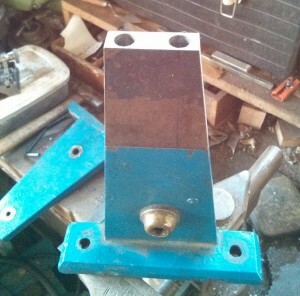 Our hammer levers and the bracket for them is missing – something else to make! Our 4 pins are all spaced increasingly far apart, suggesting the tune gets longer each quarter hour and so making it easy to see which section is which quarter. Now starting from the gap before the shortest quarter we simply wrote the position of each projection (1-8, left to right as viewed in the picture) and the length of the gap after it in beats. The most common gap was 3/4 of an inch, so we defined this as one beat. You can’t tell how long the last note is because nothing follows it. Next job was to consult a list of clock chimes. We used the ‘Watch & Clock Encyclopedia’ by Donald De Carle, 1959. There are a surprising number of chimes but they are listed by number of bells and if you count how many notes are in each quarter it’s pretty easy to work out what you’ve got (assuming it’s in the book of course). We mapped the notes to the barrel projection positions and the whole thing fits perfectly, as did the timings. 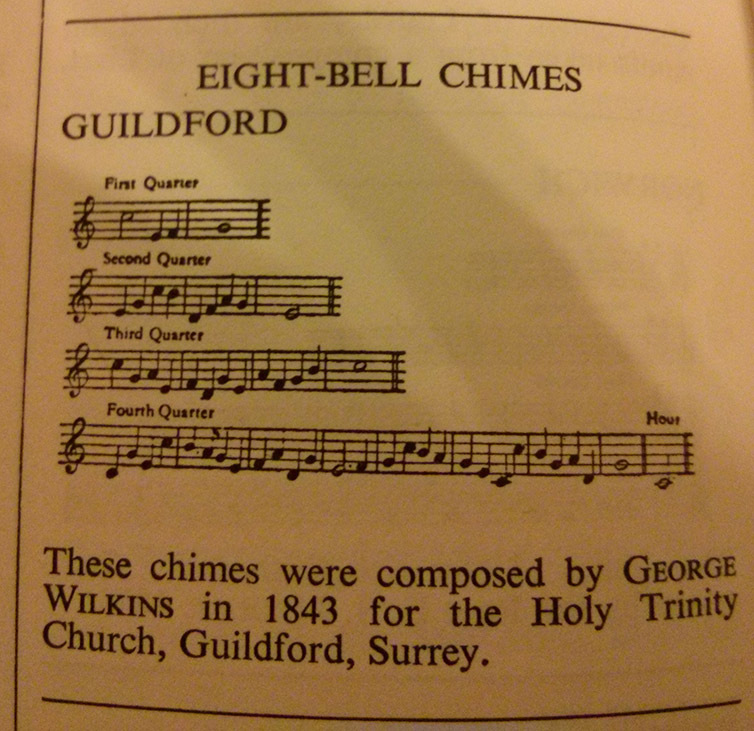 Ours was actually the first 8 bell chime listed – Guildford chimes. 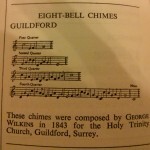 According to the book Guildford chimes were composed in 1843 by George Wilkins for Holy Trinity Church, Guildford. 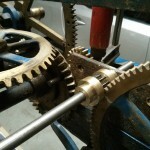 This is our first real new part for the clock. 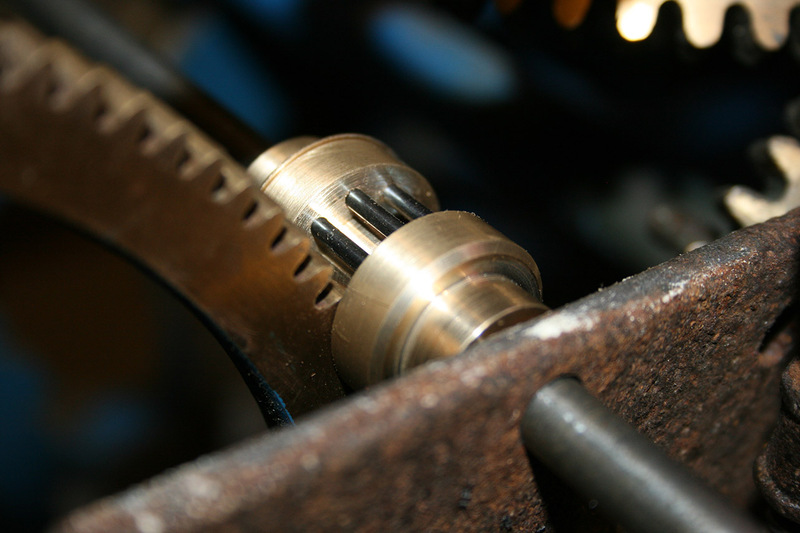 This 10 pin lantern pinion is on the escapement arbour and engages with a 120 tooth wheel. 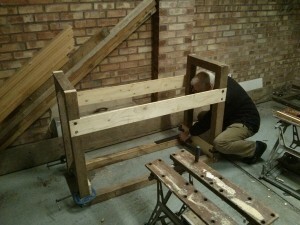 The actual arbour and the rusty support in the picture are just temporary. The bulk of it is made from a single peice of brass. 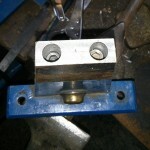 Both sets of holes for the trudles were drilled in one go from one end. This means only one end cap is needed. 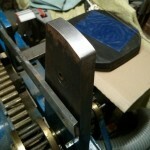 The end cap is a separate piece which we intend to solder on, which is how we initially thought the originals were made. Rather than just a washer to cover holes we made a complete end cap, it seemed easier to make that way. We need to be careful to not get the trundles too hot else they’ll loose their temper. 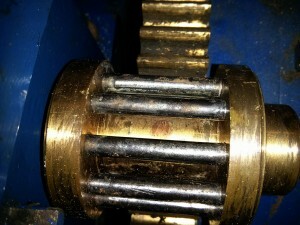 How easy will it be to separate it again in the future to replace a worn pin though? Once the end cap is attached it will be turned down to a perfect match to the body of the pinion. In order to faithfully reproduce the original parts we needed to work out how they were actually made. This took a bit of time to work out for the lantern pinions. On initial inspection it wasn’t obvious how they were attached to the arbours, but this turned out to be because they were so dirty and the original fixing was so neat. 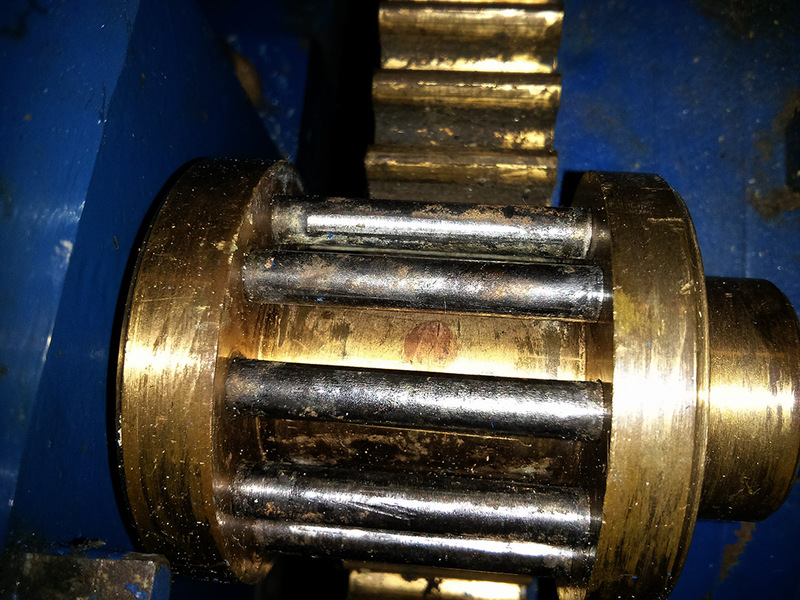 When we got one cleaned up we finally found a bronze pin in the centre of the pinion. 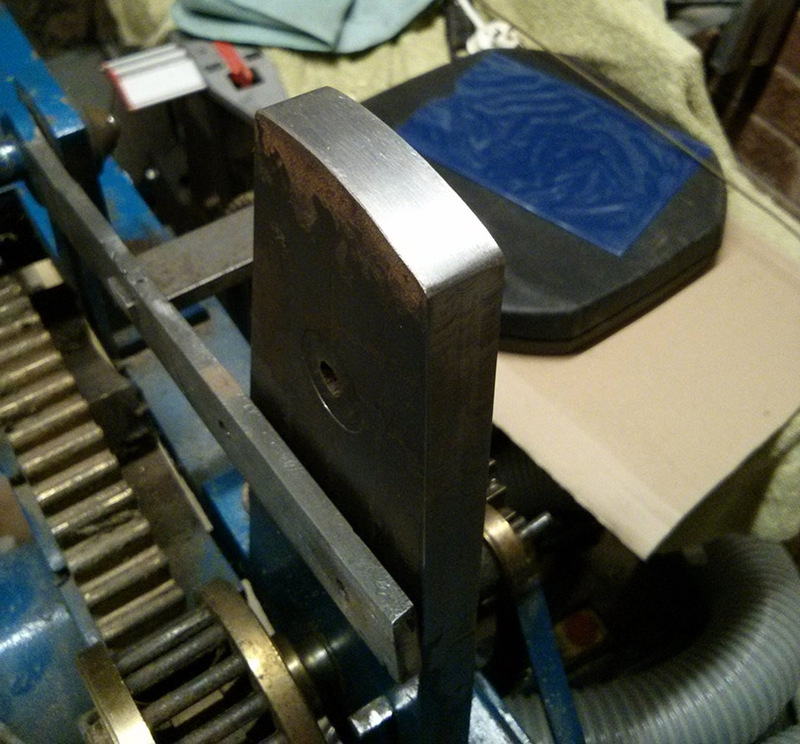 This appeared to have been machined smooth and so blended in really well (hence any dirt, or insufficient light in the workshop, and it was invisible). It shows clearly it the image, but that’s zoomed in, taken with bright flash and I’ve tweaked the colours too so it’s easier to see than looking at the real thing. 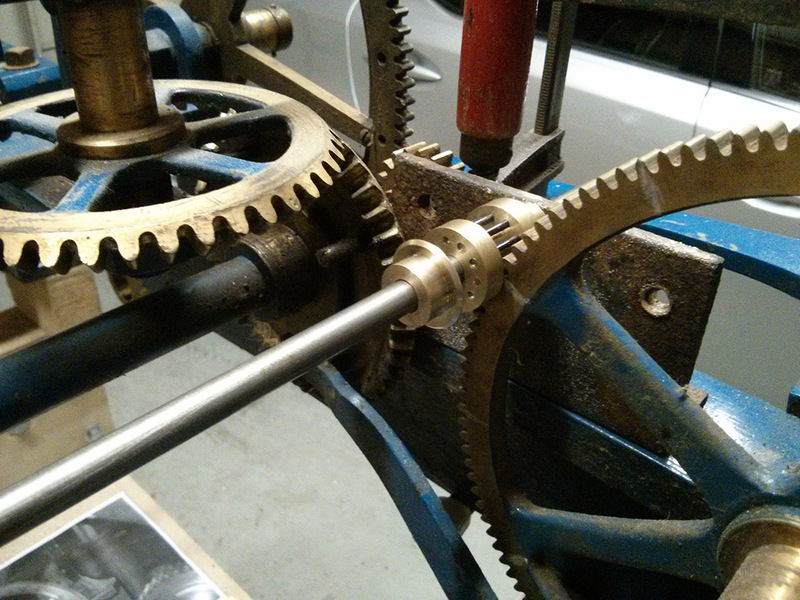 However, this pin is beneath the trundles (the pins along the pinions, which engage with the teeth of next wheel in the train) which must have been inserted afterwards, yet the pinions ends aren’t open! This suggested it was made as two separate ends and the trundles sandwiched between them, but then you’d need two pins to hold the ends to the arbour. 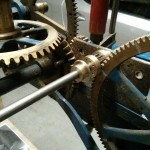 Only after closer inspection of another lantern pinion on the clock did my Father spot that there were end caps on the pinions. 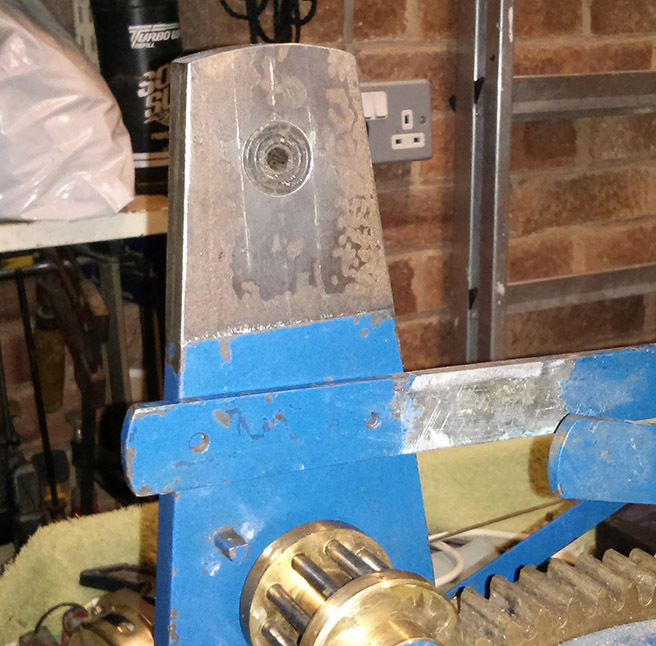 They are basically very well fitting brass washers pushed on to the end to cover the holes containing the trundles (at first we thought they might be soldered on, but apparently they are just pushed on). 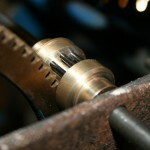 They are then machined to a perfect fit with a bevelled edge that masks the joint line. On one of the larger pinions there is a small gap where the hole in the washer isn’t a perfect fit around the arbour which gave it away. 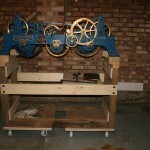 The result is really neat and serves to emphasise the quality of the original clock. This involves many unknowns. We don’t know the length (and so the period) of the pendulum. 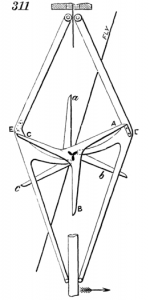 We don’t know what kind of escapement it should have. From looking at many similar Smith clocks on the internet (we are yet to find one identical) we are pretty sure it uses a pin wheel escapement. We don’t know how many pins, although most we have seen have 35 pins. 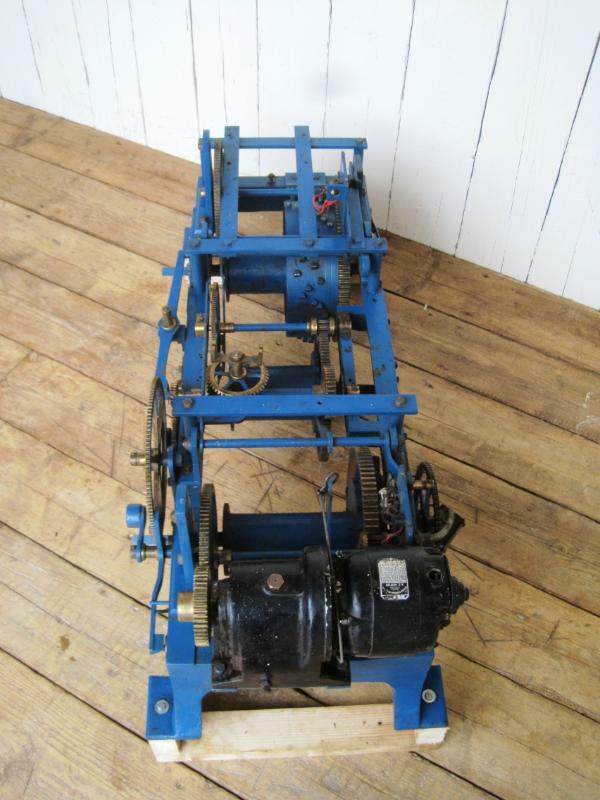 We don’t know how many trundles the lantern pinion (opposite end of the arbour to the escape wheel) should have, no clear pictures found on the internet. However, we do know that the next wheel in the train has 120 teeth, and needs to make 4 full rotations per hour, so we can work backwards to make some sensible suggestions for our unknowns. 120 teeth rotating 4 times per hour makes 480 teeth per hour. 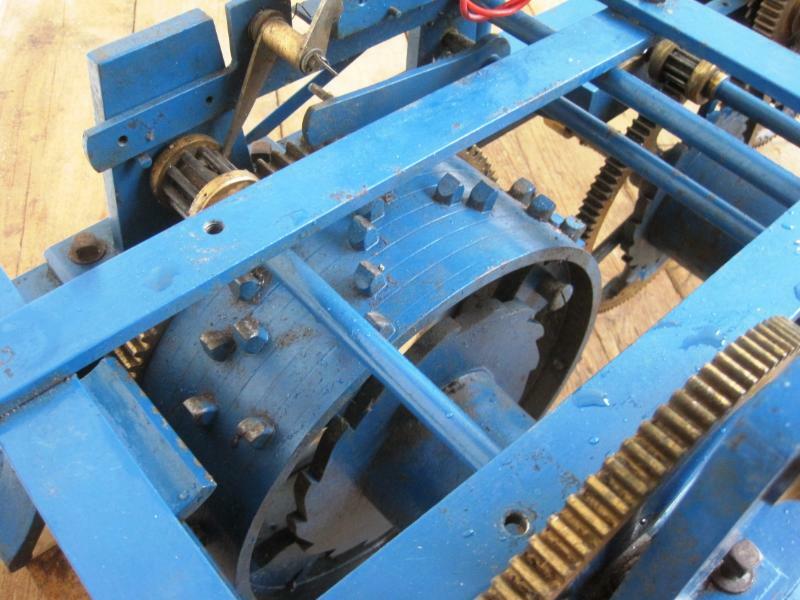 With 3600 seconds per hour we need to move one of these teeth every 7.5 seconds. 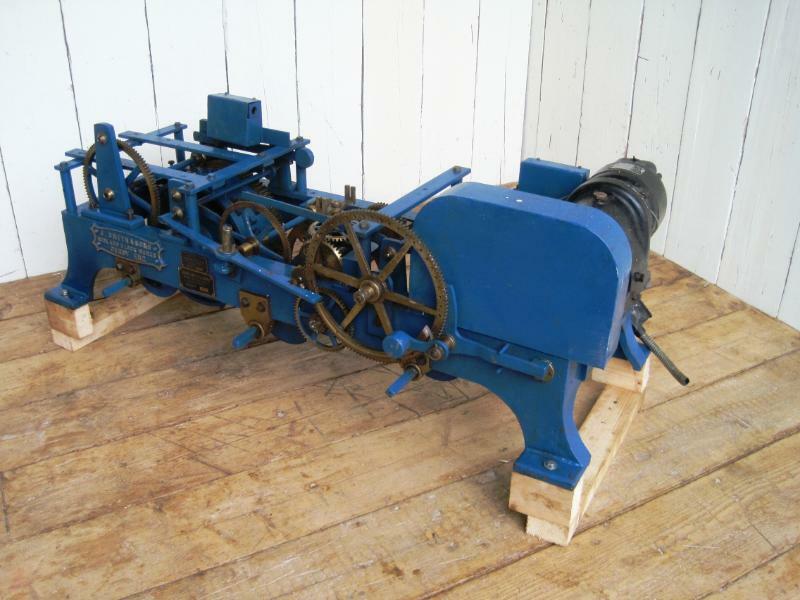 Some measuring of the teeth on the 120 wheel suggest a lantern pinion with 10 trundles. 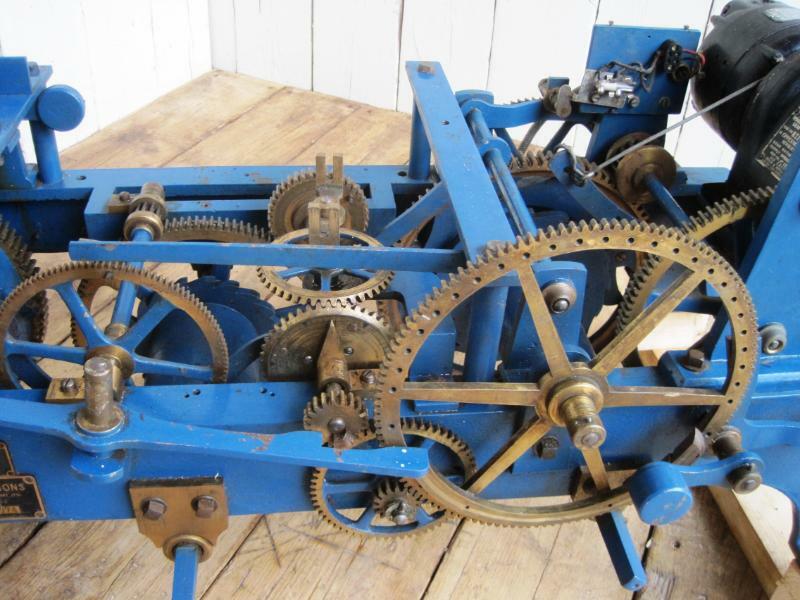 If we assume 35 pins on the escape wheel we have enough information to work out a pendulum length: 7.5 seconds x 10 trundles = 75 seconds per rotation of the escapement arbour. 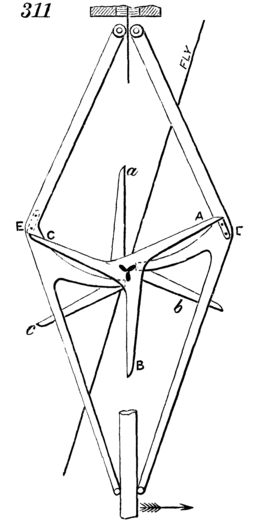 75 divided by 35 ~= 2.14 seconds for a full swing (back and forth) for the pendulum, which translates into a pendulum length of 1.14m. 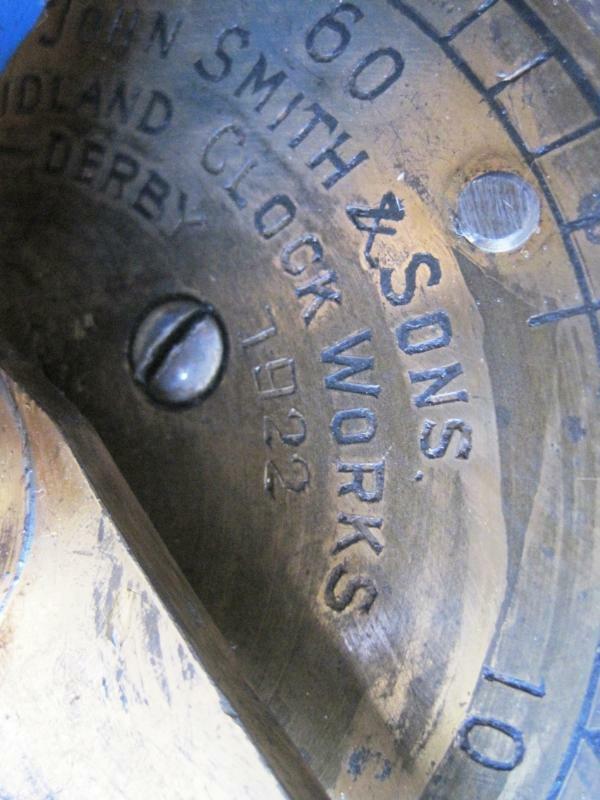 Picture is of the escapement of South Mymms Church clock, J Smith & Sons (Derby) ~1892, taken by Harald Mueller. 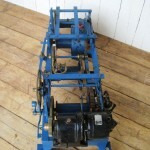 When the clock was converted to electric drive the back arbour supports were cut down. As the fly was no longer required (in fact it needed to be removed to connect the motors) these post could be cut down to make room for the motor to be mounted. This seems like a terrible way to do the conversion. 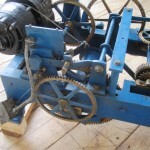 The Church Buildings Council of the Church of England provides guidelines on maintaining turret clocks which states, with regard to auto-winders and electric drives, “No parts should be removed from the movement.” and “There should be no cutting or drilling of the clock frame.” It’s likely that this conversion was done a long time ago, long before these rules were written, and was probably just how things were done then. 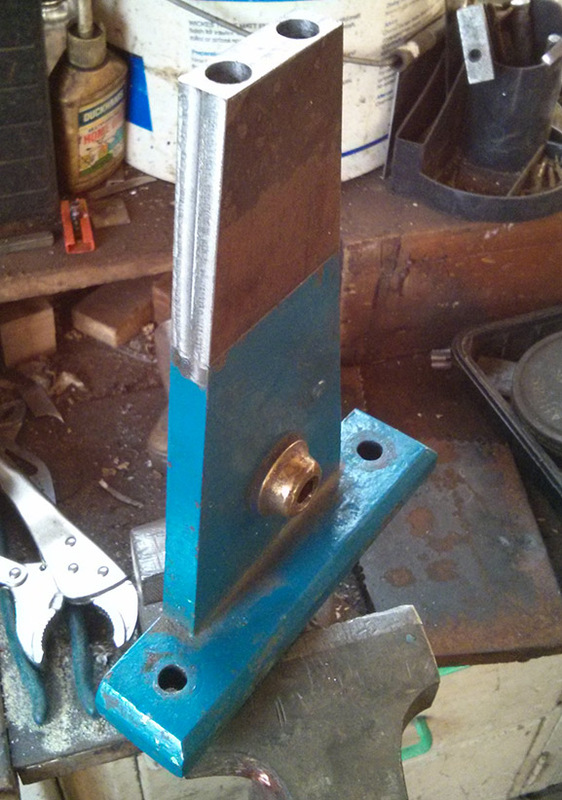 As they are cast parts welding a piece on top wasn’t going to be easy. Instead the top has been milled perfectly flat and an extra chunk has then been bolted to the top. The sides of the new piece were then milled to match the existing sides. 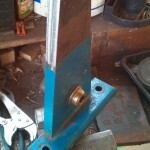 The holes were plugged by hammering in a core of the same steel and the top shaped by hand to match the existing pillars. A hole was then bored to take a new bush (not yet made). Working just above floor level wasn’t going to be very comfortable, and you need space underneath the clock to get the barrels out, so a stand was needed. 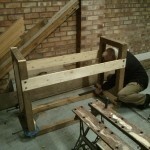 This was made from wood we had on hand, all we needed to buy to make this was a few extra coach screws. 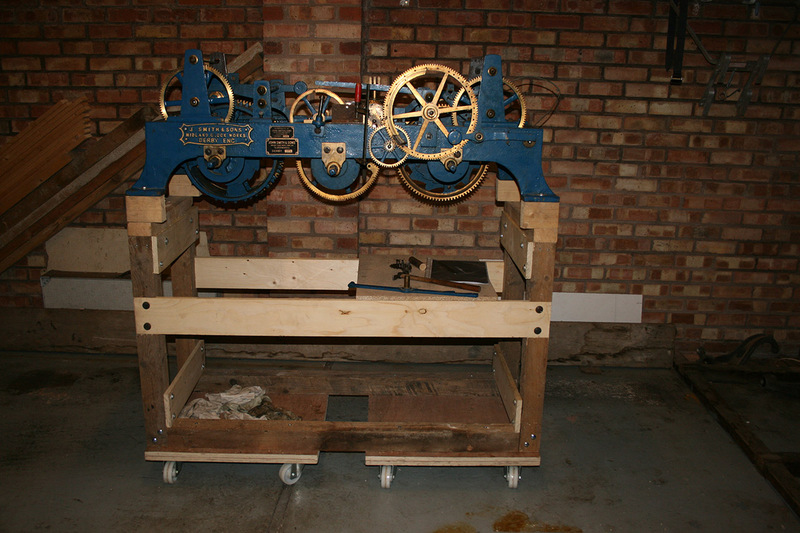 The stand needs to be pretty strong as big cast iron framed turret clocks are heavy (not sure exactly how much this one weighs, we must try and weigh it at some point) and so are the weights and the pendulum . The uprights are 3×3 inch and the the stand is rock solid. 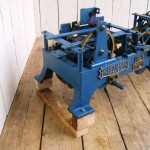 As we don’t yet know the pendulum length we made it plenty tall enough and then mounted it on the original wheeled boards I got with the clock. 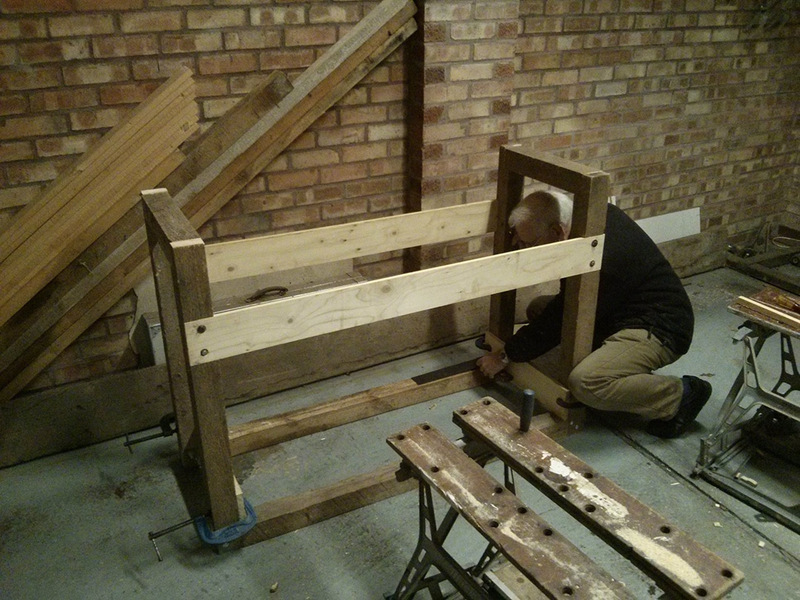 The result was a little too high to work on comfortably so we ended up having to shortening the uprights a little. I’ve wanted a turret clock for a long time. I must have gained this interest from my father who is a keen amateur horologist. 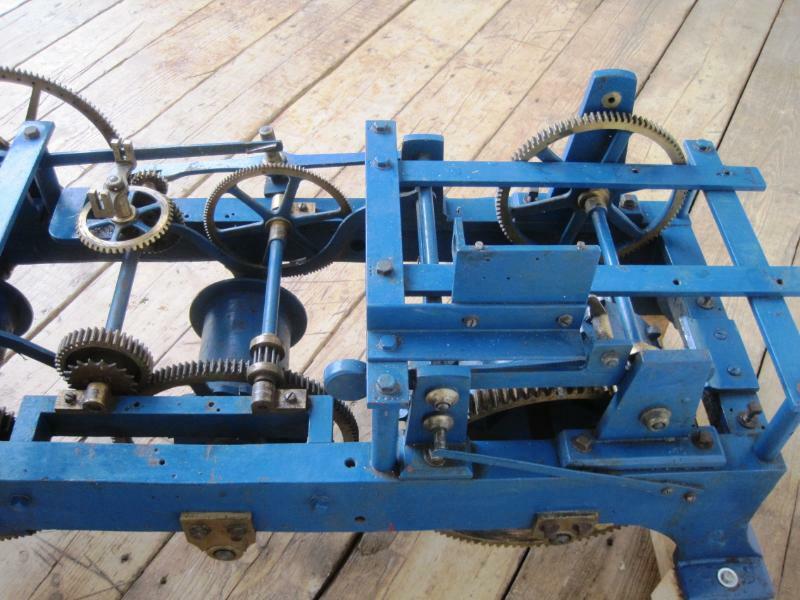 Although clocks and watches interest me to a reasonable extent, it was a turret clock that I always fancied. It’s probably something about the scale that’s more impressive. 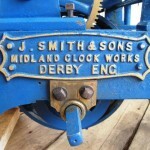 After getting to visit the Smith of Derby workshops (through my own work, unrelated to clocks) I was inspired to finally get one. 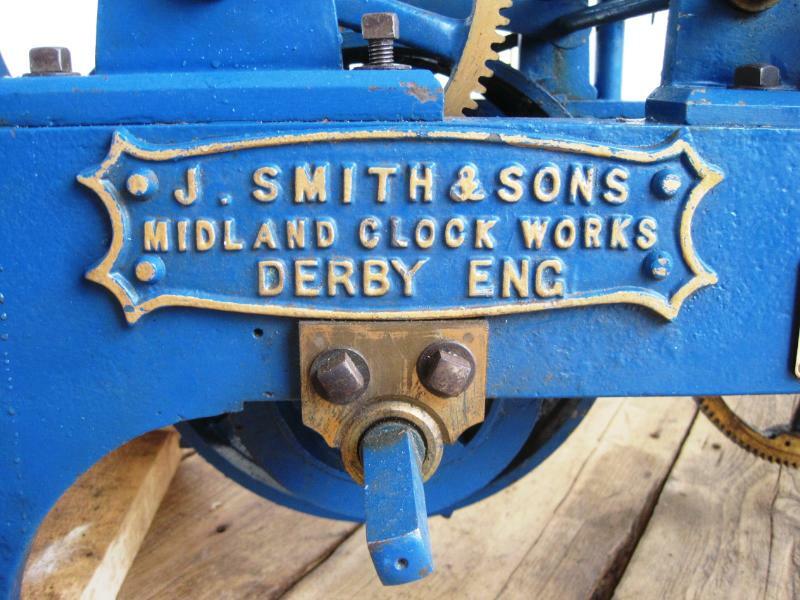 And being a Derbyshire native it had to be a Smith of course, I was also quite keen on the look of their cast iron flat bed clocks from the early 1900s. Problem is there aren’t all that many about for sale and if you’re going to do it properly you want a large three train movement. Three trains means it keeps time, strikes the hour and chimes. Smaller two train movements seem to come up for sale a bit more often, although I only know of one currently available. So I tracked down the only three train flat bed I could find for sale (at UK Architectural Antiques in Staffordshire) and went to see it. Unfortunately it was in poor condition or rather it had a lot of bits missing (most of what was there was in excellent condition) – it certainly wouldn’t go. It had been converted to electric drive at some point in the past (not recently) and this had been done in a very unsympathetic way. I don’t know who did this, it’s certainly not how Smith would do it now (totally non-destructive conservation grade conversions), but perhaps decades ago things were different. 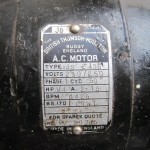 Not all of the electric conversion remained but it appears the striking and chiming trains had been directly driven by motors bolted to the cast iron frame with a lot of extra metal work. The going train had been driven by chain, probably from a synchronous motor. 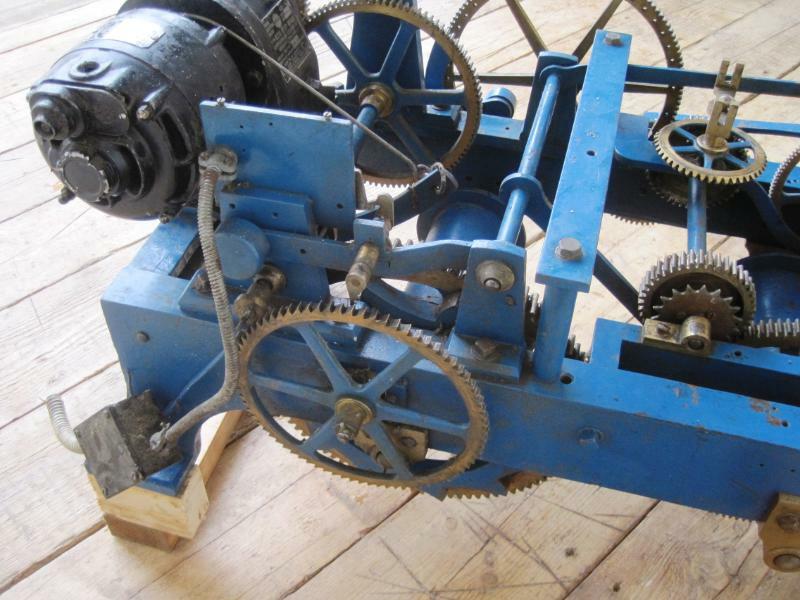 Although the motor was missing, I assume it used a synchronous motor because the pendulum, it’s large cast mount and the entire escapement was missing. On the striking train the fly was missing (as well as the arbor it should be on), the release and stopping mechanisms and one of the pillars for the fly arbor had been chopped in half to make space to mount the motor. 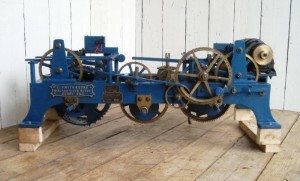 Same story on the chiming train, plus the hammer levers were missing. So begins the restoration project, which I shall be working on with my Father (who will be providing all of the skill and much of the brains for the project). We’ll have to see how much of it we can manage to do ourselves, I’m hoping we will be able to do most of it, maybe even all of it. 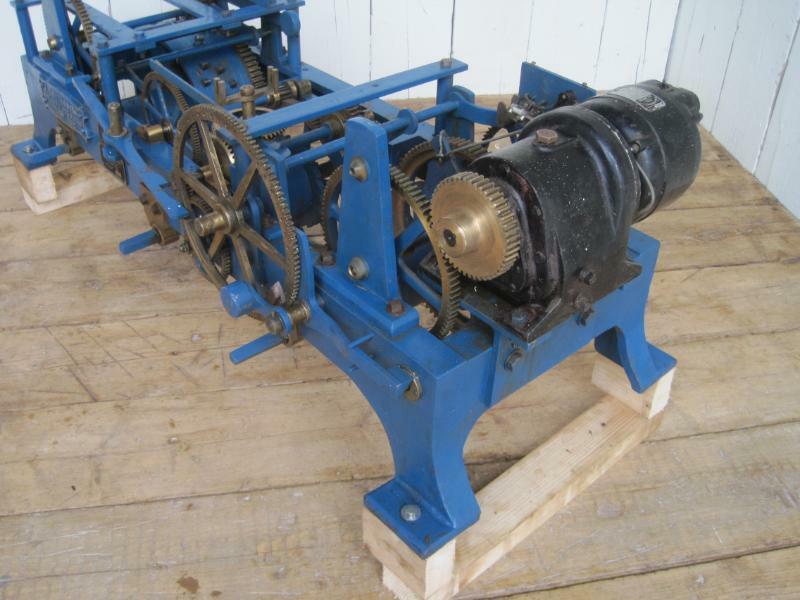 After getting our hands on it, dismantling it for a thorough examination and inspecting every picture of a Smith clock we can find online we think we probably can do it and I plan to document the process here.